Gardening can be a fun hobby, as you plant flowers and watch them grow. The three most important things for a plant are soil, sunlight, and water. Imagine picking your own flowers or eating the vegetables from your own garden. Gardening can be a fun hobby, as you plant flowers and watch them grow. The three most important things for a plant are soil, sunlight, and water. 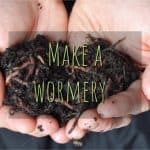 You’ll want to pick a good spot for your garden, check to see if the soil is right, and make sure your plants get enough water. 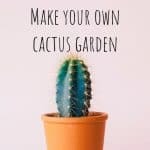 There are other things you might need to do for your plants, but for first time gardeners willing to give their garden a little care, there are some plants that are very easy to grow. SOIL: Plants need good soil to grow. If the soil sticks together too much, it probably has a lot of clay in it. That’s not good for plants, because water won’t be able to move through the soil. If it doesn’t stick together at all, it won’t hold the nutrients that your plant will need. The best soil will have clumps, but will crumble in your hands. Loam is the best kind of soil. It’s not too sticky and not too sandy. To make your soil into loam, you may have to add sand or clay to your soil. WATERING: Plants need water to survive. Some plants need more water than others. If your plant’s leaves are drooping or looking dry, they need more water. Most plants should get about 1 inch of water every week, so you’ll want to water your plants about every other day. Try to water them early in the day, so the sun can dry off any water left on the plant. How Much Water? 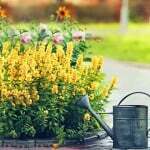 : Ways to when and how much you should water your plants. Transpiration: Why are the leaves wet? Plants in the water cycle. MULCHING: Mulch is protective cover, usually made out of moss, leaves, peat, or a mixture of wood chips. If you put mulch around the base of your plants, it can help hold in the water and keep weeds from growing. In the winter, it can keep plants warm. AREA: It’s important to take a look around your yard and find the right spot for your plants. Some flowers like lots of sunshine and others like shade. A plant will always grow better if it’s in the right place. The climate where you live is another thing to consider when you decide which plants you want to grow. Tropical plants are used to lots of sun and heat all year round, so they won’t grow well in a climate that gets lots of snow in the winter. BULBS: Flower bulbs are a kind of seed and store food for the young plant. They can be very large and they are made up of layers. Tulips grow from bulbs. Garlic and onions are bulbs that you might have in your kitchen. Corms and tubers are like long, thick, stems that grow underground. They grow plants and leaves from their bodies. A rhizome is another type of underground plant stem that will keep spreading. New growth will sprout from it. Growing Flowers from Bulbs: Find out how to grow bulbs in your garden. PLANTING: If your flower bulbs are supposed to bloom in the Spring, you have to plant them in the Fall. If they are supposed to bloom in the fall, then plant them in the Spring. Some plants won’t bloom if you plant them too deep, so it’s important to follow the directions that come with the seeds or bulbs. If you’re not sure or there are no directions, ask an adult to help you. LEAVES: Plants and bulbs gather and make food with their leaves. As long as the leaves aren’t dead, keep them on the plant or bulb. Why Are Leaves Important? : Photosynthesis and how plants make food. DIVIDING: After a few years, plants that come from bulbs might not be growing as many flowers. This is usually a sign that they have to be divided. This means that there are smaller bulbs now growing around the big bulb. You’ll have to dig up the plant and take the small bulbs away. They can be planted on their own now. Look in a garden book to find out when the best time of year for dividing your bulbs. Kid Friendly Plant Ideas: These plants are very easy to grow in almost any soil. They also have very colorful and pretty flowers. 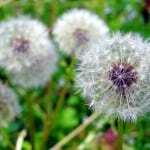 Easy-to-Grow Plants: Different kinds of flowers and plants that are easy for kids to grow. Sunflowers are some of the easiest flowers to grow. They can grow to be 3-10 feet tall. They usually have bright yellow leaves and a dark brown center. The seeds are big and easy to handle, so planting them is very easy. Sunflowers will grow in almost any kind of soil. Impatiens can come in bright colors and are easy to grow. They like to have some shade, while they’re growing in rich soil. There are different kinds of impatiens, so there is sure to be one that will fit in your garden. Geraniums will grow bright flowers almost all summer long. They are very popular plants and beginning gardeners can grow them easily. As long as they are planted after the frost and their leaves are kept dry, geraniums will be very happy in your garden. Balloon flowers get their name because they look like blown up balloons before they bloom. 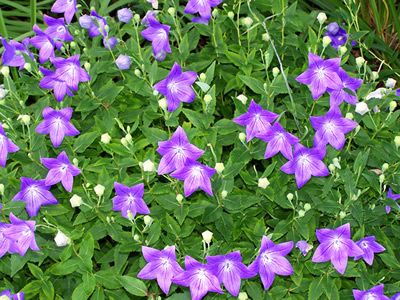 The flowers of a balloon flower are star-shaped and these plants grow lots of flowers every year. Balloon Flowers: Balloon Flowers in bloom. Titun Arums are the tallest flowers in the world and they can grow up to 10 feet tall. Broccoli is a flower and a vegetable. Venus Flytraps can go 1-2 months without eating. Many flowers have petals that can be eaten or turned into teas. Morning Glories get their name, because they bloom in the morning and die in the afternoon. Bees are attracted to bright and colorful flowers. Bamboo might seem like wood, but it’s actually a grass. 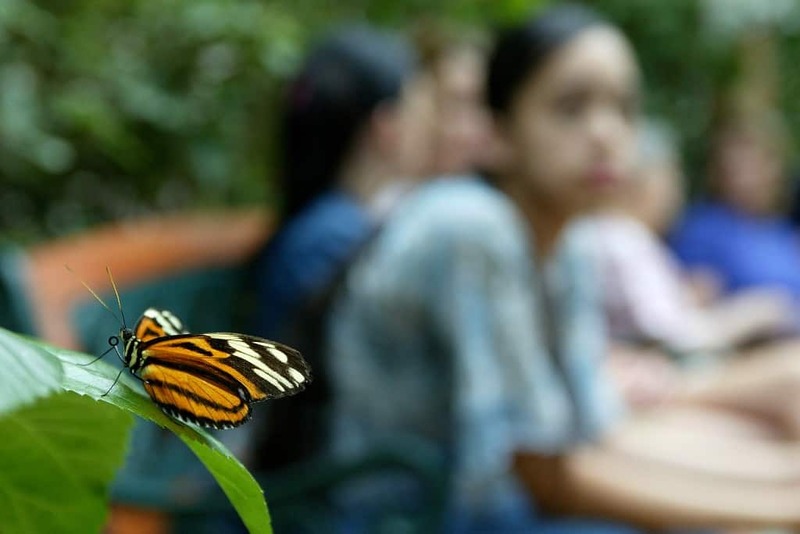 Pioneers used milkweed sap to cure warts. Before breath mints were invented, people chewed parsley leaves to get rid of bad breath. The saguaro cactus is the slowest growing plant in the world. It grows just one inch in the first 10 years of its life! Dan the Gardener: Play games and learn how to garden with Dan. Gardening at School: Start a garden at your school. The Missouri Botanical Garden: Learn all about the parts of plants and how plants grow.